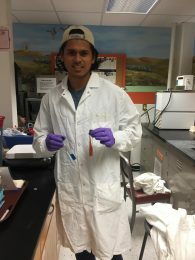 Whether he’s running for the K-State track team or studying at Call Hall as a food science student, Rene Perla truly works hard at everything he does. 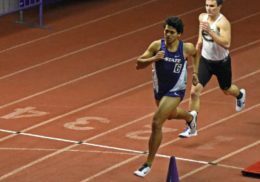 As a K-State athlete, Rene currently dedicates 20 hours of his week to track practice and soon will be dedicating even more time when the spring season arrives and traveling for the sport begins. Althoug h he works around a busy schedule, Rene finds gratitude for the challenges he faces along the way. This motto definitely influenced decisions in Rene’s life prior to coming to K-State. Now a junior in food science, Rene is trying to figure out what part of food science he likes best. “I’m interested in food quality and safety, microbiology too,” Rene mentioned. Although he hasn’t determined a concentration, Rene still plans to attend graduate school in the future. Rene’s dedication to learning and sports certainly leaves an impression on those around him. Keep an eye out for Rene this upcoming spring as he competes in the 400 meter hurdles!